The Tale of the Spirit of Power is the third chapter in Yoshi Topsy-Turvy. Before it begins, the Spirit of Power tells Yoshi who he is and that he needs at least six Happiness Medals to proceed. He says how Yoshi must work hard at his training to become stronger. 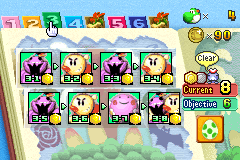 The first part of this mission takes place in a green area with a Yajirobē‎, a few Shy Guys, and a Piranha Plant. The second part is extremely short and only features four coins with one jump to the checkpoint warp as well as a few Igashira-kun and Shy Guys that cannot be reached. The third part has a Chime Ball that can be rolled over some Shy Guys and a Chime Note as well as a Piranha Plant in the middle. The fourth part is another very short area with only a single Igashira-kun and no coins. The first part takes place on a snowy mountain and requires Yoshi to slide down to collect the coins and jump to reach a higher slope. The second part introduces Ship Yoshi and requires the player to tilt the console so the water level can allow Yoshi to collect coins. The third part is an auto-climbing area that is very similar to the one in the previous chapter. The final part has five cannons with coins littered through the air. The first part takes place in a green area with a single Tap-Tap, Igashira-kun, and lift. The second part contains a few rolled-up carpets, Tap-Taps, and a Yajirobē as well as some spikes at the bottom. The third part is an upwards area with more rolled-up carpets and Tap-Taps. The final part has a Wrecking Ball with a few more Tap-Taps. The first part of this mission contains multicolored sliding objects as well as red spikes and a Tap-Tap at the end. The second part is an auto-climbing area where Yoshi can now move diagonally on the trail. The third part features Ship Yoshi and is similar to the Ship Yoshi part in Mission 3-2 but has a few high slopes in the way. The fourth and final part has a Shy Guy Ship as well as many parachuting coins. The first part of this mission features a few sets of sliding lifts as well as a few Ravens. The second part has a boulder that can be ridden over a large number of Ravens at the bottom of the area and a Raven up on a higher platform. The third part takes place on a snowy mountain and has more Ravens and a half-pipe area. The final part has once again more Ravens and a single Igashira-kun that can be used to destroy the Stone Blocks that are in the way. The first part contains a sliding lift with a few parachuting objects including a single bomb and some spikes on the bottom. The second part has Balloon Yoshi and many clustered groups of coins. The third part is another auto-climbing area but with more instances of moving diagonally. The final part has Ship Yoshi and much lower ceilings in the way of the path. The first part of this mission takes place on a snowy mountain and has a few parachuting apples, including a much larger one. The second part has a Wrecking Ball over spikes that can be used to destroy the Stone Blocks, which are hiding coins behind them. The third part contains a few rolled-up carpets, a Yajirobē‎, some Igashira-kun moving up and down on rails and some parachuting items including an apple with spikes on the bottom of the area. The final part has a Snowball that can be rolled in the snow to make it bigger.